A 147-year-old home will have to be moved to make way for a new connector road from St. Margarets Bay to Highway 103. The Nova Scotia government announced the favoured route between exits 5 and 6 on Thursday. Transportation Minister Bill Estabrooks said this option was in the best interests of the community. "Developing this route will have the least impact on the environment, while improving existing road safety conditions and serving the most people from St. Margarets Bay Road," he said in a statement. The route chosen is Option 3B, which is east of Kieley Lake to Ingramport, with a roundabout close to St. Margarets Bay Road. Estabrooks said the route was the "best option because of the criteria that has been explained to me." "And when I hear the local fire chief saying, you know, 'We need a connector road,' and when I hear first responders say that for various reasons we would like to have this connector road. All those things, in combination, say to me it was something that had to be done." Sean Kirby, who has lived in the area for three years, is opposed to this route. He disagreed with the minister's reasons for choosing it. "But the reality is that local firefighters say the best route is Option 1, which is just two minutes up the road, literally right next door to the firehall in this area. They say that's the best route for first responders," he said. "So, I can't explain why Minister Estabrooks would say that. I just don't think it's true." Department staff are negotiating to move the house to another location. The new road and connector were chosen from six possible options. 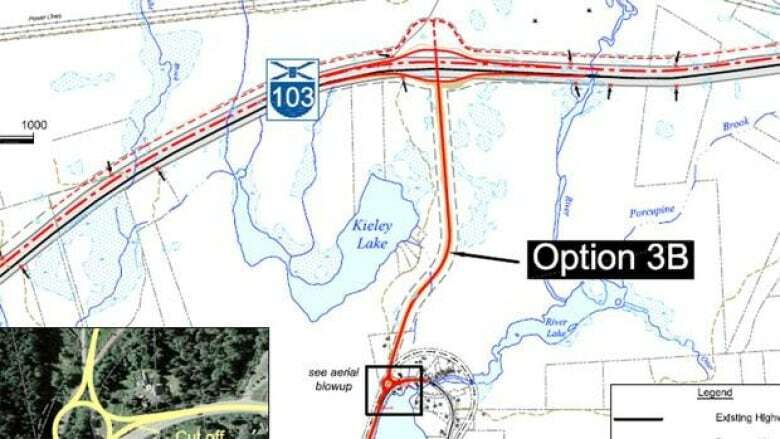 The interchange and connector road are part of a multiyear Highway 103 twinning project and are included in the government's Five Year Highway Improvement Plan. Planning and engineering work will continue, with construction slated to begin in 2014. The estimated cost of this project is between $10 million and $12 million.